Can be found from lower foothill elevations up to treeline with Pine, Fir and Spruce. This mushroom is more robust than most Russulas. 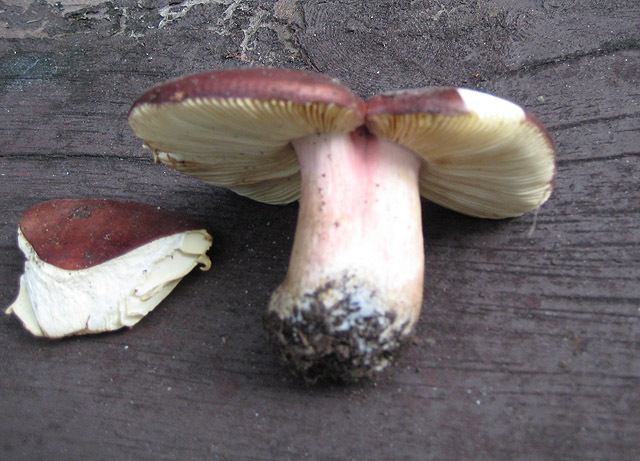 Sometimes with a pinkish blush on the stem, yellow to orange spore print and stains brown where nicked or rubbed. Cap colors are variable from Reds, Purples, Oranges and others. Tastes mild when a small piece is sampled raw then spit out. Cap usually convex. This mushroom can take some time to recognize and is not good for beginners due to possible confusion with other poisonous russulas. 2. Smells Fishy or Shrimp-like in older or dry specimens. 3. Yellow to Orange spore print. 4. Sometimes Reddish pink blushing of the stalk. 5. Cap convex usually darker in the center. 6. Tastes Mild (Not spicy, peppery, or acrid). 7. More robust than most red russulas, sometimes larger in size. This is one of the best edible Russulas and most sought after. It can be grilled, toasted or broiled.